One of my favorite summer things is getting out early to enjoy the cool am temperatures and the beautiful first morning sunlight. Since summer was so long in reaching Duluth this year, it’s only been within the last week that this idea was even worth considering. But today was the perfect opportunity. Soon after sunrise Rich and I loaded our bikes on the car and headed out to West Duluth. Our destination: Superior, Wisconsin. 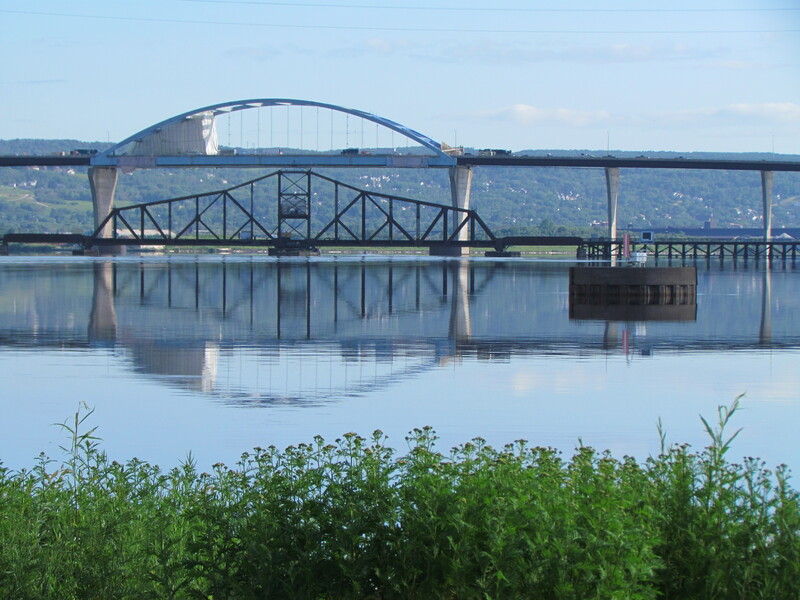 We parked on the Duluth end of the Bong Bridge, mounted our bikes and proceeded to cross over the bay on the bridge. The bridge was wonderfully bicycle-friendly, with a dedicated bike lane that was well protected from traffic. 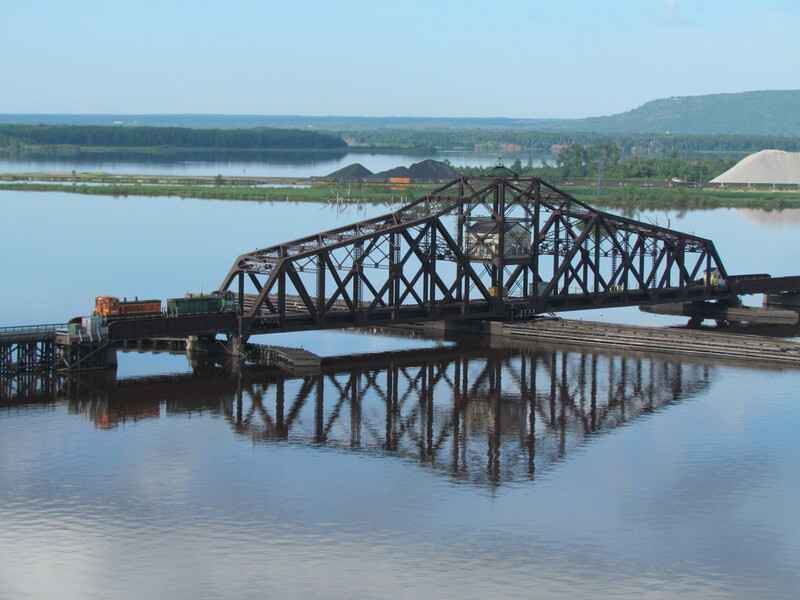 As luck would have it, we also had a scenic view of the St. Louis River basin on our side of the bridge. With the rising sun behind us and calm waters in the bay, we had lovely views of the railway bridge and surrounding waterway. We entered Superior in the Billings Park area of the city. There we were immediately able to access the bay, first on city streets and then on a bike trail through the park that was literally within feet of the water’s edge. 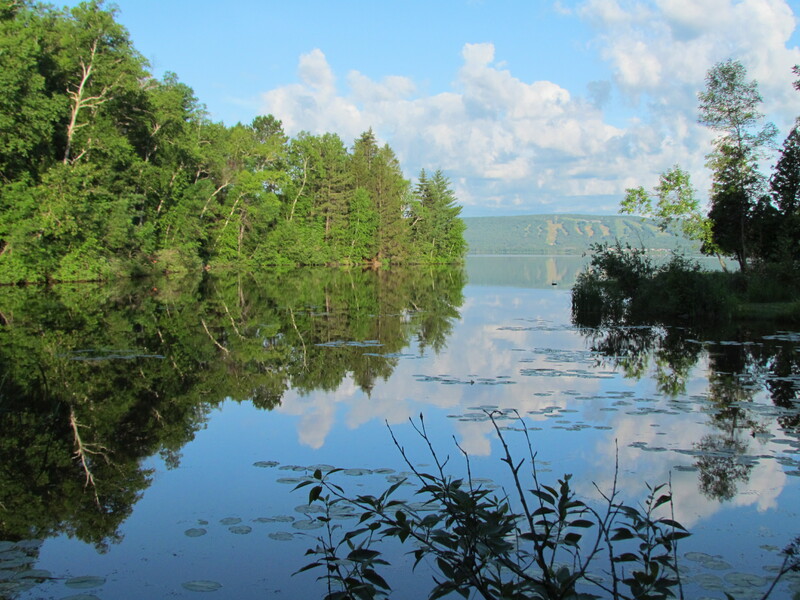 With the water reflecting the morning’s scenery and fluffy clouds, it was an idyllic landscape. Leaving the park, we entered a beautiful neighborhood full of impressive houses and steeply rolling hills. Still within proximity of the water, it was easy to imagine the luxury of the homes with waterfront property. 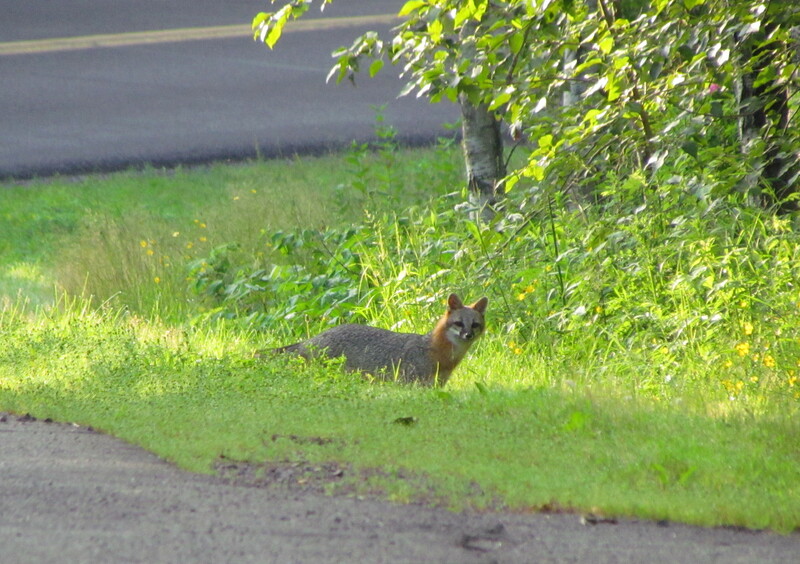 It was early and quiet enough that we managed to get within photo distance of a gray fox just down the road. 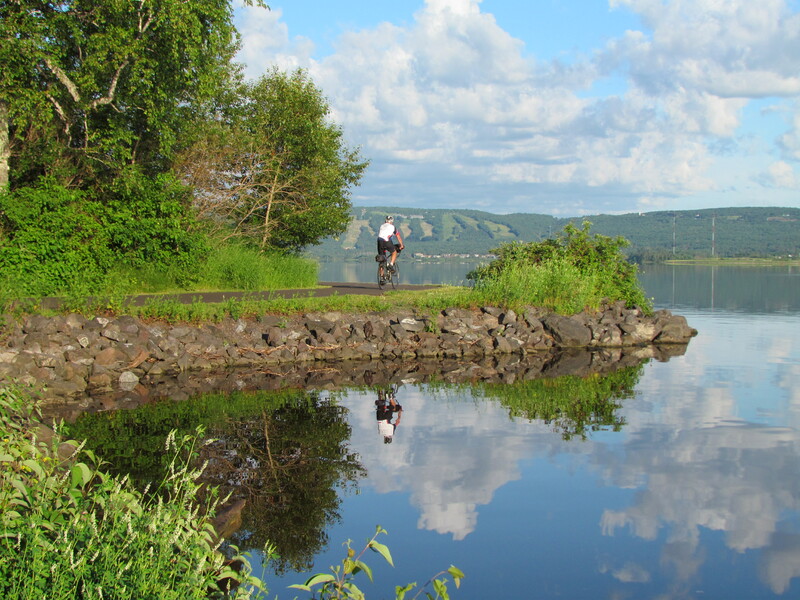 We continued on into the Superior Municipal Forest and traveled part of the Millennium Trail. There wildflowers grew in abundance as the trail wound through woodland areas and meadows. It was a peaceful trail, and clearly a popular destination for runners and dog walkers out for their morning rounds. It was a pleasure to return via the coastal trail and back over the bridge for a second opportunity to enjoy the views. The sun was still low enough to provide its warm glow to the scenes. And going the opposite direction provided a different perspective on everything. 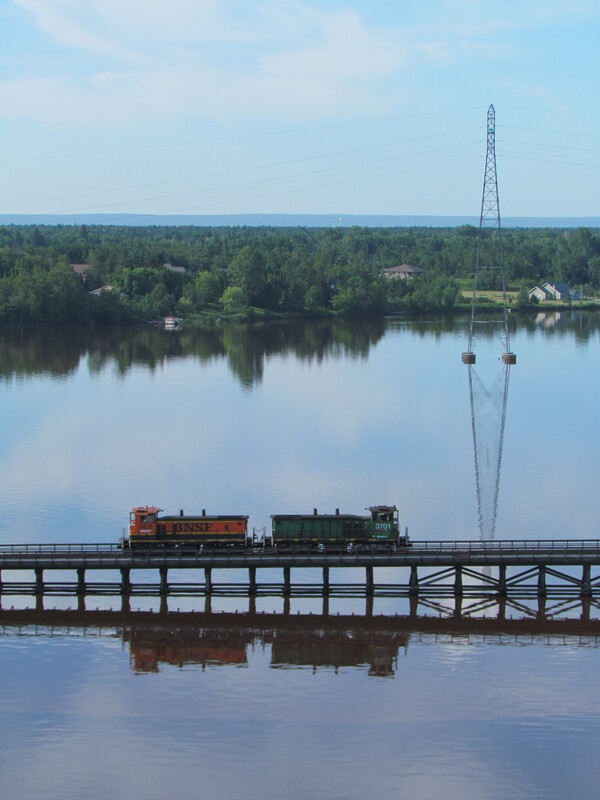 This time the railway bridge was closed, and in fact a pair of locomotives crossed the bridge as we watched. I had no idea that such beauty lay right across the harbor, with such easy access by bicycle. I just never thought to look at it from the other side before. It was clearly a Superior ride. 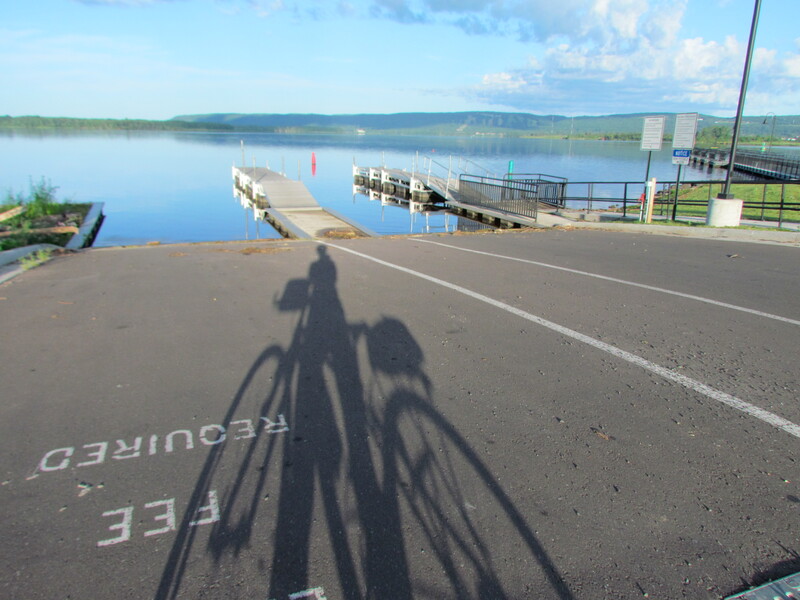 This entry was posted in Life Up North, Outdoors and tagged Cycling, Duluth Minnesota, Lake Superior, Outdoors, Photography, Superior WI by Molly. Bookmark the permalink.